Gameloft’s brand new online racing game Asphalt 9 Legends is finally out worldwide and challenges you to barrel roll & shockwave on the racing tracks with an extreme perfect nitro. Asphalt 9 Legends game features top class tracks, a variety of game modes; career, events, multiplayer, TLEs, and breathtaking graphics. And today, in this post, we are going to share a detailed Asphalt 9 Legends guide and Asphalt 9 Legends cheats, tips & tricks to master the game. So, let’s gets started! In this part, we will learn about the cars, cards or blueprints, star up, 360, game modes, leveling up, parts, controls, and much more. Make sure to read everything. Let’s dive in! For Example; Bugatti Chiron is the best car in Asphalt 9 Legend(S-Rank) with the highest rank points(3,577). On the other hand, you start the game with Mitsubishi Lancer Evolution and its rank points can not even exceed 791. In short, it will take a long time to unlock these superb cars in Asphalt 9 Legends. It would be better to focus on these low-rank cars and complete time-limited events or get promoted to the higher league by beating the rivals in multiplayer mode to grab the premium cards. You can check the complete list of cars by tapping the car icon(main screen of the game -> at the top menu). You need to gather the required number of blueprints or cards in order to unlock a specific car. For instance; To unlock Lamborghini in Asphalt 9 Legends, you need 60 Lamborghini blueprints or cards. How to check the acquisition path? Noe, let’s learn about the blueprints or cards! So these are the free-ways to obtain car’s cards in Asphalt 9 Legends game. Now, let’s learn how to increase the rank of cars or upgrade the car or how to raise the star level. How To Increase The Car Rank? To increase the car performance or stats or attributes such as speed, acceleration, and nitro boost, we can increase the rank points or stats of a car. All you need to do is upgrade the car. It costs you credits. Go to the car menu -> tap the car to upgrade -> hit the upgrades button -> confirm the upgrade. Once you reach a certain upgrading stage, you will not be able to upgrade it until you raise the star level of that car. Let’s learn how to star up. If you have, then go to the car menu -> tap the car -> choose an attribute(speed, nitro or other) -> tap the + icon(parts) -> confirm. You earn reputation points by playing the game. After gaining enough, your reputation level will increase and as you level up, new features such as multiplayer, events, trading, and more gets unlocked. You earn garage points by upgrading the cars. After gaining enough, your garage level will increase and as you level up, the game will add better cars to the card packs. So don’t forget to upgrade the cars if you want better cars in Asphalt 9 Legends game. Read the upgrading guide above. Asphalt 9 Legends game offers a variety of game controls options; Touchdrive, Tap To Steer, and Tilt To Steer. Let’s learn about all and their pros & cons. Touchdrive – If you keep this feature on, your car will take turns automatically. 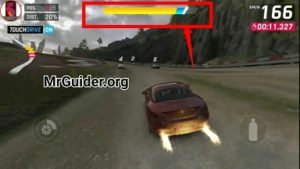 In this mode, you don’t have full control over the car. For example; if there’s a ramp at the right side, then it’s difficult to move from left side to right side as you don’t have full control over the car. Pro – it makes the drifting easier. Tap To Steer or Manual Control -> If you disable the touchdrive, you will get full control over the game; tap the left side of the screen to turn left, tap the right side of the screen to turn right. And use the brake+left/right screen to drift. Cons – Uncomfortable for drifting. Pros – You have full control over the car; helps you to collect more nitro, to stunt as you can easily turn the car and pass it through the ramp. You can change the controls in the game settings. Go to the main screen of the game -> at the top-right corner, tap the Gameloft Icon(G/Gear) -> game settings -> controls. Or before you start the race, turn off or on the touchdrive. Update – Now you can customize the tap-to-steer controls in the settings. Tilt Mode – It’s hard to master. If you have opted for touchdrive mode, then it’s easier to drift the car. Just tap the button at the bottom-left side of the screen in the race. We would recommend you to choose touchdrive controls in Asphalt 9 Legends game if you are not good at drifting the car. So this is the short Asphalt 9 Legends guide for the beginners. Now, let’s head to the Asphalt 9 Legends cheats, tips & tricks to master the game. How to perform perfect nitro? After tapping the nitro button in the race, pay attention to the nitro bar. Some of its part will turn blue. Tap the nitro button again once the bar or pointer touches that blue part to activate the perfect nitro boost. How to perform shockwave nitro? To activate shockwave nitro in Asphalt 9 Legends game, double tap the nitro button when the nitro bar is full. If you perform 360 stunts in the race, the nitro bar will charge fast. It is one of the best ways in Asphalt 9 Legends game to get turbo speed. You can also charge it by drifting the car, but it will be slow in comparison to 360 stunts. In the race, at the top of the screen, there would be some icons, these icons highlight; turns(left or right/⇐⇒), ramps(⇑), the number of nitro. Pay attention to these icons and don’t miss the opportunity to jump or pass through the ramps, to grab nitro. If you are not using a car and you have its extra cards, then it’s better to sell and earn trade coins. Don’t know how to sell cards? You can spend these coins for premium car cards. 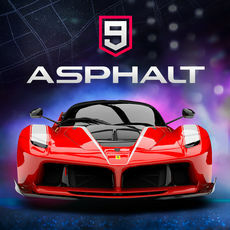 Join a club in Asphalt 9 Legends. Once joined, race in any game mode and you will earn club reputation points. Collect enough and activate the club’s milestones. You can earn card packs, blueprints, credits, and much more. In Asphalt 9 Legends, you can purchase some blueprints or car’s cards in exchange for credits, tokens and trade points. Make sure to check the legend store daily and grab the precious blueprints in exchange for in-game currency. The game will reward you 30,000 credits for free when your balance(credits) gets dropped below 10,000. You can hit or destroy other cars or knockdown the rivals in the race; just activate the nitro or use 360 when close to a rival. The latest update to the Asphalt 9 Legends brings the new reward system. There would be a daily goal tab at the bottom menu. Head to it and there you can check the daily goals. Completing all these goals in a day will reward you a special item reward(goal combo reward). Or if you want free car cards, the play the Daily Car Loot event every day.